Want to head out for a couple of drinks tonight? Bring your friends along to one of the best bars in Nevada. We guarantee you will have a great time at one of the following bars listed below. So make some plans today with your friends head on over today! 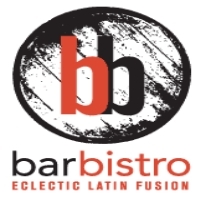 Bar Bistro is located in the Arts Factory, in the heart of Las Vegas Art District. The menu is an eclectic Latin fusion that reflects influences from Spain, Italy, France, Morocco, Egypt, Israel and Lebanon. The dishes and sauce are homemade and meticulously prepared with the freshest of ingredients. The bar is known as one of the best bars in Nevada for its own support to the community and using locally source ingredients whenever possible. You can have your next business lunch, bridal reception, social gathering or holiday party here. 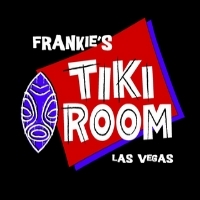 Frankie’s Tiki Room is a unique combination bar of south seas exotica and modern primitivism, with a hint of Las Vegas kitsch. This is the place where you can escape to the fantasy any hour of the day or night. The menus consist of exotic rum drinks in the tiki lounge or enjoy traditional cocktails while gambling at the bar. This bar is one of the best bars in Nevada with great tiki bar design built by Bamboo Ben. Frankie’s signature tiki is a monstrous island warrior by Crazy Al Evans. 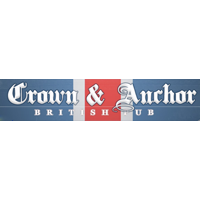 Crown and Anchor located in Las Vegas serves a full food and beverage menu at all times. This British mainstay feels like a homey pub, where someone just forgot to take the lights down after December and everyone might learn your name if you stay a while and drink enough ale. The bar is considered one of the best bars in Nevada. 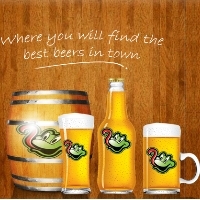 The beer collection is varied with different menus for daily and weekly specials. Come and visit this place for the great entertainment. 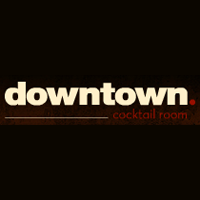 Downtown Cocktail Room located in the heart of Las Vegas, Nevada has 3,000 square feet of warm bohemian-chic décor with the sexiest libations and staff. The bar is the best place to hang out after work, take a date or bring your friends to relax, chill and have a good time. You can also enjoy a down-tempo, lounge funk, or instrumental/soulful house music all around. The dress code is individual and the lounge has a positive attitude at all times. Freakin Frog was created by Adam Carmer in Las Vegas. This bar is home of the largest selection of beer in the USA. With hundreds of thousands of beer, whisky and entertainment options, the guests will enjoy a great time in one of the best bars in Nevada. The bartenders are friendly and the bar is best for making friends and creating memories. It is also a great non-smoking place with a very down to earth and friendly owner. 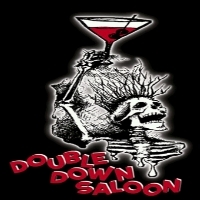 Double Down Saloon is known as a clubhouse for the lunatic fringe in Las Vegas, Nevada. The bar has the best live music, pool, pinball, hipsters, bohemians, rockabilly greasers and many more. Sometimes, there are touring bands and Hollywood types kicking back away from the tourists. You will expect the unexpected here. The interior is filled with vivid chaotic and psychedelic murals covering every inch of walls and ceiling providing the backdrop, while disturbing videos come at you from all directions. This place is never closed. 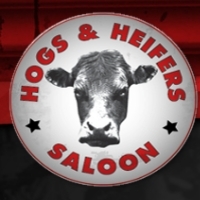 Hogs & Heifers located in Las Vegas, Nevada is a fun and one of the best bars with great bartenders. It is also great for bikers. The waitresses are funny and interact with the crown in super fun ways like getting people up on the bar dancing, or calling people out for what they are wearing or doing. The happy hour special is every Monday to Friday from 12 pm to 4 pm and you can expect $2.00 off all drinks. The Jam Specials is every month on the 2nd Monday from 8 to 11 pm. 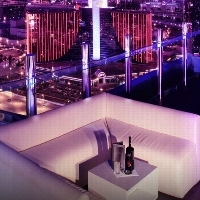 Ghostbar is the legendary nightclub bar located on the 55th floor of the Ivory Tower at Palms Casino Resort in Las Vegas, Nevada. The bar will re-open in August 2013 with a new look. White leather lounges and 14-foot floor to ceiling windows will make you feel as if you’re hovering above the energy of the city. Guests will be able to view all the lights on the Strip at night. With a half indoor and outdoor design, this bar offers the ultimate experience of the best bar up in the city. 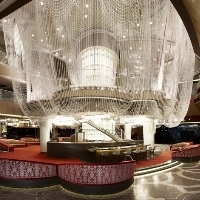 The Chandelier is located in the Cosmopolitan of Las Vegas, Nevada. The bar is a living breathing architectural wonder created by luminous beaded curtains of light. It has three unique bar housing experiences with a bit of a playground, art exhibit and cocktail haven all at once. If you get inside the Chandelier, you will have very detailed, carefully considered sophisticated cocktail haven delights. This bar is considered as the best bar in the city. 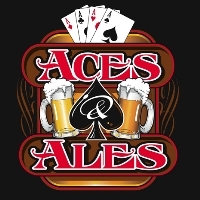 Inspired by the classic Gastro-pub of London, Aces and Ales located in Las Vegas, Nevada appeals to the casual connoisseur. This bar is best for beer drinkers who want to break free from the normal activity. There are 150+ bottles of draft beers with many vintage and limited selections. There is also a unique offering of a full range of beer styles, from Pilsners and Imperial Stouts to Reds, Hefeweizens and IPAs. The food is prepared with chef-driven quality-conscious.